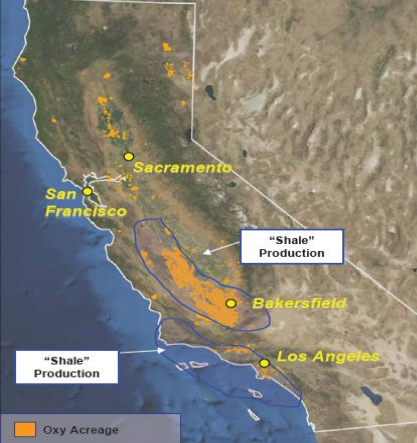 The Monterey/Santos shale oil play includes the Lower Monterey and Santos shale areas and is located in the San Joaquin and Los Angeles Basins in California. The active area for the Monterey/Santos shale play is approximately 1,752 square miles in the San Joaquin and Los Angeles Basin. The depth of the shale ranges from 8,000 to 14,000 feet deep and is between 1,000 and 3,000 feet thick. 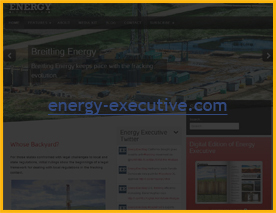 The shale oil play has an average EUR of 550 MBO per well and approximately 15.42 Bbl of technically recoverable oil. Other average properties were estimated for the Monterey/Santos shale play. These include the depth (11,250 ft.), thickness (1,875 ft), porosity (11%) and total organic content (6.5%) for the shale. There are five companies with leases within the Monterrey/Santos oil shale play, these companies have a total active area is calculated at 1,121,500 net acres (1,752 square miles). Plains Exploration and Production Company reports an average gross well cost in 2010 of $1.2 million dollars per well. Oxy reports cost for vertical well ranging from $2 to $2.5 million and horizontal well costs ranging from $5 to 7 million. They also report finding and development costs between $8 and 18 dollars/BOE, depending upon the field. Oxy Corporation has undertaken a 4-year development program and remains the largest leaseholder within the Monterey/Santos play. 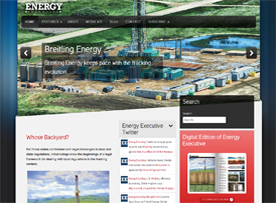 Seneca Resources/ NFG first went into production in February 2010 and has completed a 14 well development program. In 2010, Venoco completed their 1st horizontal well in the Monterey Basin and plan to increase their net acreage. This play has not been evaluated by USGS.